I have implemented re-configuration. Is that even a word? It is now! I am not convinced that everything is being disposed of correctly, but I think I have most, if not all, of it. If you notice crashes after re-configuring many times, let me know as it most likely means something is not being released. MotionEngine.prototype.destroy. "This method is called to destroy an engine and is only used once per engine" - sounds seriously cool. Reconfiguration it is; its working perfectly. I've been trying the Reconfigure button for a few scenarios at your Lab and at home, back and forth and back and forth between changing a value on the User Interface parameter page and viewing the changing output with my browser console open - no errors observed. Your change appears to work for all UIs so far. 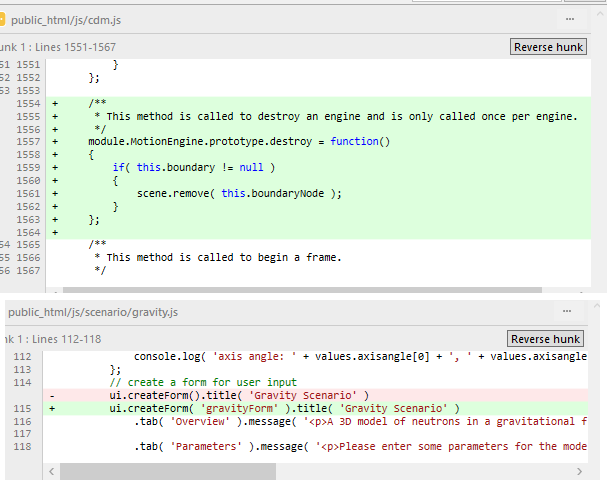 Why did you make a change - adding the 'gravityForm' label to the gravity scenario only? You indicated that the label is optional, so why would one want the label? In any case I'll be happy to make that change across all the scenarios if you'd like, repetition is the only way I seem to learn anything. Oh, I forgot to tell you about that. You can now set an ID on a form. It is optional and a default will be applied. At first I used that to store the form in the UIManager because I couldn't get a nice expression to determine if the form was already created using JQuery. So I store the form in an object, which is a property of the UIManager class (called forms). When I realised that you didn't really need to specify the ID, I just left it in but made it optional. You can use it to create multiple forms. You define all of the forms you want in the scenario init function, but you only call show() on the first one. In the success function of that, you show the second form and in its success function you show the next, etc, etc. I haven't actually tried it yet, but it should work (famous last words). And, it turns out, the destroy method is actually being used multiple times per engine (every time you press reconfigure). It is considered the end of life for the engine, but the init method can be called again to start a new life, so to speak. This allows some things to be reused and others to be released and recreated. We have a set of Reconfiguration errors after using Reconfigure 3 times to vary Offset Pair UI's moving particle's offset distance. At first I thought I needed to repair the collision scenario; until I saw that each new Reconfiguration added a new set of post collision lines. In the Collision group scenarios the user has the option to turn on/off lines and target boxes. If no lines or target boxes are selected, all well and good. When one does select lines, additional Reconfigures will not remove those lines. I especially like the fact that Reconfigure defaults to a Reload when there is no user interface for that scenario. I use the left arrow to Reset the scenario, is there a single key for Reconfigure so one can do so without opening the control panel? Adding to my short term to-do list: updating the Help pages. It's missing several things like the vectors or the Reset, Reconfigure and Reload buttons. You are going to have to deal with that in the scenario init function. Any objects you add to the scene, apart from the Particles themselves (which strictly speaking, you don't add to the scene graph), you will need to keep a reference to them in the scenario and check to see if they exist prior to creating and adding them. You also may need to remove them from the scene if you determine that they already exist, rather than just leave them there. It depends on what you are using the objects for. If they depend on values supplied by the user, then remove and recreate them, otherwise they can just be added once and forgotten about. Technically, reconfigure does not default to reload, it just equates to almost the same thing. No key binding at the moment, hadn't thought about it. Not sure what key to put it on yet, maybe the Home key. Yeah, that's the problem with documentation, you have to keep it up-to-date. I'll study your directions and see what happens next. In the meantime, I tried to make an unmoveable UI scenario using the hosohedron configuration but it was too easy for unmoveable neutrons to be placed in overlapped positions near the top and bottom positions - sometimes freezing the screen. Ok, no Unmoveable UI yet, I simply added a new non interactive Unmoveable scenario - Hosohedron. That is a problem with the hosohedron algorithm. The top and bottom get very crowded because they contain the same number of particles as any other latitude. That is why I stopped using it for the charge points and found an algorithm that attempts to make equal areas between points, rather than equal numbers of points. The collision code should separate them, but it can take quite a few iterations before they are all separated. It is all of those collisions that cause it to slow down. You "found an algorithm that attempts to make equal areas between points, rather than equal numbers of points" eh? Excuse me for asking - which algorithm is that? The .js file and line numbers would be perfect. Actually I was thinking a 60 vertex icosa based configuration might work best for the Unmoveable UI, all 60 may fit inside the proton's emission radius. With respect to lines, grids, targetboxs, trajectories and whether they exist or not, I haven't tried any coding yet. I'm trying to wrap my mind around null. I see where your instructions involving these new or existing lines is an expansion of the Gravity scenario: var initRandom = function ( factory, ui ). Thanks, that's probably all I should need. I'll be able to play with it a bit before crying uncle. In case you might otherwise miss it for a few days, I sent you an unrelated PM. Ah, null. Such a simple, yet strange concept. I take it for granted these days and don't even think about how others might not understand. Null was invented to solve a very simple problem. It is the answer to a very simple question: Do I have a value? We usually think of variables based on what they store and what we use it for. An integer is going to store a number and we can do things with it like increment and decrement, add and subtract, etc. Sometimes, we need to think about a variable in a more abstract way. We need to know if the value stored in that variable is actually a valid value. We use null to say: No, there is no value here, do not use it. But you can accomplish the same thing with the typeof operator. This instruction will return a string that tells you the type of a variable. Sometimes you need it to work a specific way, and other times it really doesn't matter. You might come across all of them though, so it was worth showing the different ways this might be done. A view looking down at the latest Unmoveable. First things first, I had to replace that awful unmoveable hosohedron I made yesterday with a 60 vertex truncated icosahedron. 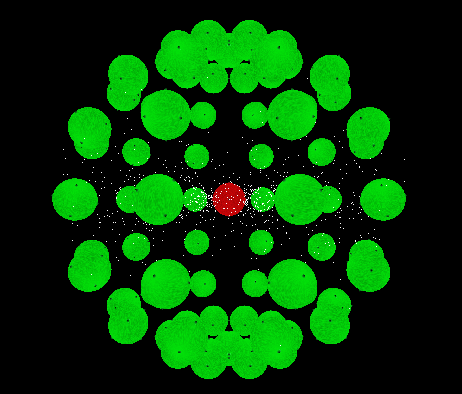 This configuration lets more neutrons get closer to the central proton without overlapping positions like the hosohedron did. It's still not a user interface, but I believe the 'association football'/buckyball is much better. We have an Unmoveable UI. Beginning with the truncated icosa configuration, the user selects a few proton parameters: position ( inside the neutrons or not ), y-axis spin velocity, and spin axis orientation. If there’s an overlap, Reconfigure makes repositioning the proton easy. For the accompanying image, I turned on the spin vectors to show which neutrons were being effected – the spin vectors do act strangely at times. Anyone, Please feel free to comment, suggest or criticize. Additional scenario suggestions are welcome. Unless I think of something else real soon, I’ll look at my collision line null assignments next. You "found an algorithm that attempts to make equal areas between points, rather than equal numbers of points" eh? Excuse me for asking - which algorithm is that? The .js file and line numbers would be perfect. // at this stage, points contains THREE.Vector3 objects where each one refers to a point on the sphere at the given radius. You can use EQS.ANGLES_130 or EQS.ANGLES_406 in place of EQS.ANGLES_46 if you want more points. Unfortunately, you can't choose an arbitrary number of points. Here's a simple temporary spherical scenario init46PointSphere01, I put it together with your instructions included in order to see the output for the algorithm you mentioned. //each one refers to a point on the sphere at the given radius. No joy. I believe something is wrong with .place( points(i)). It's causing the browser as well as my system to freeze up. Same when I replace .place( points(i)) with .place( points[i]). The function is properly registered at the bottom of the 'Spherical' scenarios list so that's not the problem. No change. I’ve made several more efforts. EQS apparently requires a pointer/function call. I noticed its absence, and tried placing EQS in the spherical.js function argument list - here it is in the fourth position. I tried that yesterday too, but this morning I was more organized/systematic. There are errors for each position: the spherical group goes missing from the scenario listing; EQS.LocationCreator is not a function; EQS is not a constructor; points is not a function. EQS is undefined when I remove it. I tried it in the init46PointSphere01 function call too with no better results – I had to try. I’m good with a constant degree of difficulty in working toward a positive outcome, it comes with the territory. You cause me great pain and joy Sir. Sorry, I forgot about the EQS reference and just assumed it would be available. notice I also remove the i = i++ part, as that would not work as you expect and i would not increment. That is because there are 2 versions of ++. There is the post-increment, where the ++ comes after the variable, and there is the pre-increment, where the ++ goes before the variable. After that code has executed, you might expect post to equal 11 and pre to equal 12, but they won't. post will equal 10 and pre will equal 12. That is because var post = i++; will execute the = operator before the ++ operator, hence why it is called post-increment. However, using the pre-increment will do it the other way around. evaluate i = i++ --> set i to current value of i (which is 0), then increment i, which makes it equal to 1. So inefficient, but it wold work. There's nothing amiss here - a brief moment in time. 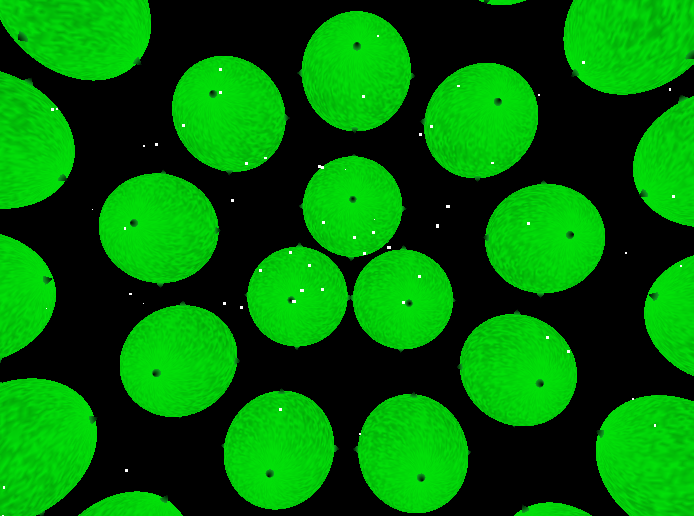 The Unmoveable UI uses unmoveable neutrons; here, in the sphericals, the particles are free to accelerate together. The 130 particles were initially placed an emission radius ( r=10 ) from a proton at (0,0,0) where they were well placed and close together. 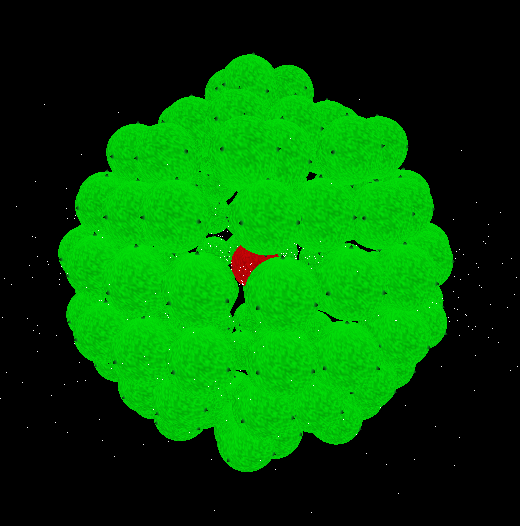 The started accelerating together - the image shows them a little bit overlapped - that's part of a collision simulation - just before they begin to burst apart. Needless to say, your directions worked perfectly; I spat ( a small mess) when the mass burst apart. The 130 spherical works much better than the C60. I'll go back and to finish the Unmoveable UI again. This has been a long term discussion - the number and distribution of charge points on a sphere - that I can follow. I do seem to recall seeing that algorithm in a search for this project a few months ago, in any case it's nice to see you've implemented them. Maybe C60 should be placed with the EQS group. Update. initOffCollisionPairUI2. The line problem. How do we remove prior scene lines after Reconfigure changes the scene? I haven’t gotten your directions to work yet. Before I could even begin I needed to add the array myLines. Now all lines are added to myLines before they are added to the scene. That alone is progress. I see that adding an array to contain all the lines is a code improvement, adding an array of lines to a scene is more efficient and better practice than adding each individual line as they are made to the scene. That works and I pushed it. Since then, myLines is now declared in the initOffCollisionPairUI2, success function, and the lines are still calculated and added to myLines in the initOffsetPairUI2 function. I haven't pushed that myLines change yet. The problem is a bit different than I first thought. After any Reconfiguration – restart the scene by removing all the previous scene lines. Note that the total number of lines in this case is just 1 or 2, the post collision trajectories of the initially moving and stationary particles. Later, I could avoid removing lines by checking whether the offset value changes, along with the state of the show post collision trajectories checkbox; but for the time being keep it simple – restart the scene by removing all the previous scene lines first. That’s where I’m at, crawling, creeping along quite slowly. The if( myLines != null ) doesn’t work yet. Maybe because I shouldn’t make that test until after a Reconfigure has occurred. I'll try that next. Not trying to change the subject, just making an observation. 130 Neutrons UI. The array ( radius 8 ) as seen from the array center to one of the array 'poles'. What's the practical limit - the maximum number of neutral particles in a spherical array - without overlap - at a given radius? I believe spherical arrays are not idle mathematical questions but are real particle configurations that our engine might someday show to be possible. There is also the related question what is the best distribution of charge points about a spherical surface. I believe we share that interest. The minimum spherical array radius limits in the two new Unmoveable UIs was determined by the need to avoid the three each pole particles from coming into contact. I'm not suggesting that that's any problem whatsoever. When I suggested that C60 be added to the EQS group I realize that the C60 is a different type, C60 is x,y,z listed in terms of phi, while ( I assume ) the EQS group is tabulated in polar coordinates. A x,y,z/polar converter should be an easy matter - for you. 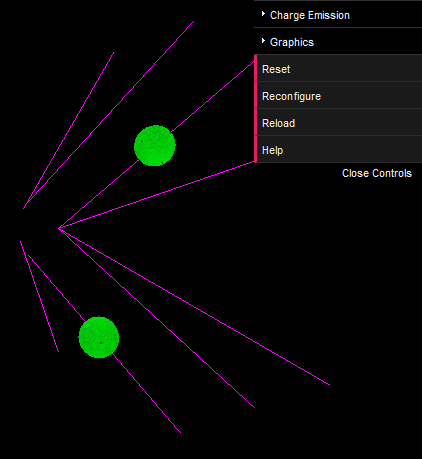 Or how about axis angling spherical arrays? Ok, I'll get back to work. It's not that simple, I'm afraid. The EQS algorithm is not exactly mathematically generating the points. It uses some pre-configured values to generate them, but those pre-configured values are not mathematically generated. I'm sure it could be done, but the paper I got them from did not present it explicitly. They gave the method, but it was still a bit human oriented, and I couldn't see a way to do it in code and didn't see the need to waste the time trying it. Each of these arrays contains more arrays and each of those contains an angle and the number of points at that level. The angle represents the distance, in latitude, from the north pole. Notice that the last entry is always 90°, which represents the equator. The number of points is used to divide 360° into, giving us an angle of longitude. We work on one hemisphere only, and just copy and adjust the latitude values for the other half. Use the angle to find the latitude of this level. Create a point for each longitude at current latitude and 180 - current latitude (for the other hemisphere). That is it, in a general sense. The actual code is more complicated, but that is what it is doing. Note that the points are not actually at the latitude specified in the data arrays. They are half way between the previous latitude and the current. That is because the algorithm is designed to create equal areas, or as close as is possible, rather than points. So I placed the points at the center of those areas. If I was using it to create the geometry of a sphere, then I would place them at those angles and use 4 points to generate a face (where a face is the flat part of a surface, think of each hexagon on the surface of a soccer ball). So it isn't a matter of just converting something else to this. It also shows why we have a set number of points and can't just specify the amount to generate. Then just play with the angles and counts to get what you want. Thanks for the great detailed descriptions. The EQS.ANGLES group is fun to play with. The EQS.ANGLES_130 spherical array is a fine standard for a large number of particles closely packed at the proton emission radius. I think I understand the basic algorithm now, but I’m nowhere near understanding the code. Your application of the algorithm to charge points on a sphere makes good sense – depending on computational complexity. I should know but I must ask - Does CPIM actually use these EQS charge points (EQS.ANGLES_46, EQS.ANGLES_130, and EQS.ANGLES_406)? Do they fit in the Cardinal point continuum? While a spherical array of neutrons makes perfect sense in the Unmoveable group; we know of no such particle configurations in nature. Or do we? Ken Shoulders proposes Exotic Vacuum Objects * which he believes consist of various large numbers of electrons although I don’t believe he gives those numbers any forms. I suppose the simplest physical configuration of large numbers of particles we may encounter would be strings of particles, linear arrays channeling mostly straight through charge. Next in complexity - planar arrays and lattices seem a safe bet. It may be wild speculation on my part, but the next thing that occurs to me are bubbles – empty spherical arrays, valid objects – inside or out. Protons outside are gravitationally attracted to the center of the bubbles - easily penetrating the spherical boundary. Looking at the EQS group totally diverted me - thanks - from my unsuccessful collision group trajectory removal problems. I couldn’t get the myLines commands you provided to work so I included a copy of myLines called theseLines. I included creating lines only when requested – that didn’t help, so I went back to making all lines every scene. I could see the scene.remove command remove those lines in the current scene, but my code hasn’t removed those lines from subsequent scenes. I’m afraid I may have to leave it alone till I figure what else to do with it or you put me out of my misery. Airman wrote.I should know but I must ask - Does CPIM actually use these EQS charge points (EQS.ANGLES_46, EQS.ANGLES_130, and EQS.ANGLES_406)? Do they fit in the Cardinal point continuum? Du’oh! The Precision group – Low, medium, high and overdrive is the charge points continuum - Cardinal, EQS.ANGLES_46, EQS.ANGLES_130, and EQS.ANGLES_406. I was already embarrassed to report no progress with collision line removal. Plus I was worried about your possible reaction to the blasphemous proton boundary I was playing with; your sharing the EQS algorithm seemed like tacit approval. Unmoveble group, 130 Neutrons UI. I added motion to the central proton. The 130 neutrons are still fixed in position and can spin, they now act as a proton cage. At low velocities the proton generally makes orbital type motions inside the Neutron spherical array, is the scenario still an Unmoveable? Please excuse the chattering, I’ve been watching the spin vector distortions again – I’m certain they are renormalization errors – say by a missing renormalization somewhere in the charge calcs; I don’t believe I’ve shared that strong opinion before. Sorry, Airman, I seem to have missed this post. My best guess as to why the myLines array is not working for you is that the declaration of it is in the wrong place. Note that the myLines variable is declared outside of the initRandom function, definitely not inside of it. LongtimeAirman wrote: What's the practical limit - the maximum number of neutral particles in a spherical array - without overlap - at a given radius? You actually sent me the link to the answer to that in the MBL thread: http://milesmathis.forumotion.com/t464p25-molecular-bonding-language#3694. Use the diameter of the neutron/proton as the edge length. 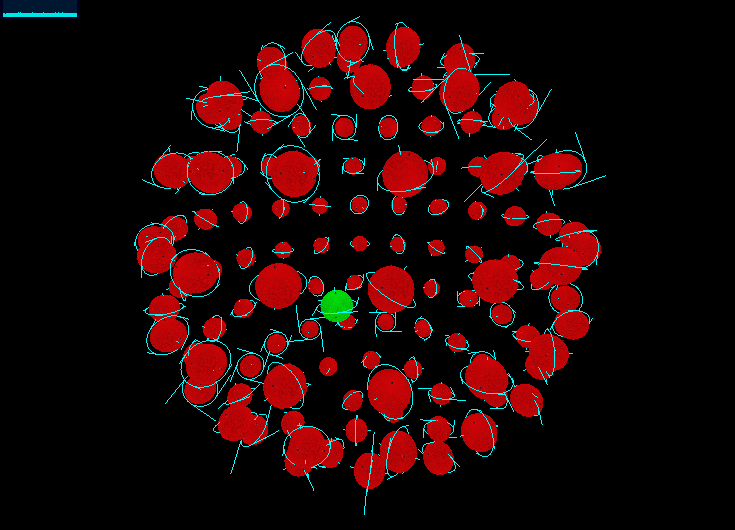 If you want a bit of space between the particles, add it to that diameter. If you get stuck, I'll go through the MBL code and see how to adapt it to this problem. I was just about to write about the precision settings, but you beat me to it. Well done. I created the Unmovable scenario because I wanted to see the spin on the neutrons by the central proton to make sure that it was being applied correctly and highlight any issues with it. Initially, the central proton was movable, but then I added gravity and it started to move away, so I also made that unmovable to retain the original purpose of the scenario. I don't think it matters too much if some of the particles are movable. 130 Neutrons UI. Now with a ‘Reverse particle types’ checkbox; in addition to the proton cage, we can choose a neutron oven. I wanted to see how a central neutron would react to both gravity and charge. Watching the proton spin adjustments is of course, extremely interesting. Please excuse the somewhat repetitive images, I think they’re better than family photos. MBL is Great Guns Nevyn. 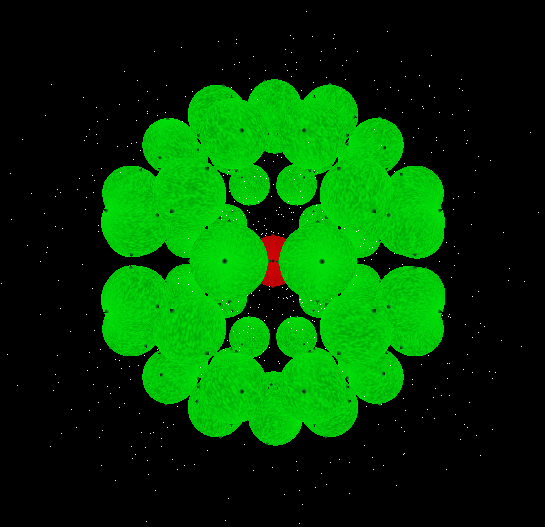 The cyclic polygon algorithm is necessary to cope with varying ring molecule component lengths. For example, say there’s a ring created by 2,3,4, and 5 alpha long sets of stacks – the cyclic polygon algorithm allows one to calculate the various stack positions on the ring(within a given tolerance). In CPIM, protons and neutrons have the same diameter. The cyclic polygon problem reduces to simply dividing the circumference (at the desired radius) by an integer number of angular particle widths ( n plus gap) in the ring - the N-gon. So I can imagine producing an N-gon ring (a spherical array will come later) according to the radius and minimum particle gaps selected by the user. With that understanding, I suppose I can start with the cyclic polygon algorithm. Is that close to what you thought I was thinking? 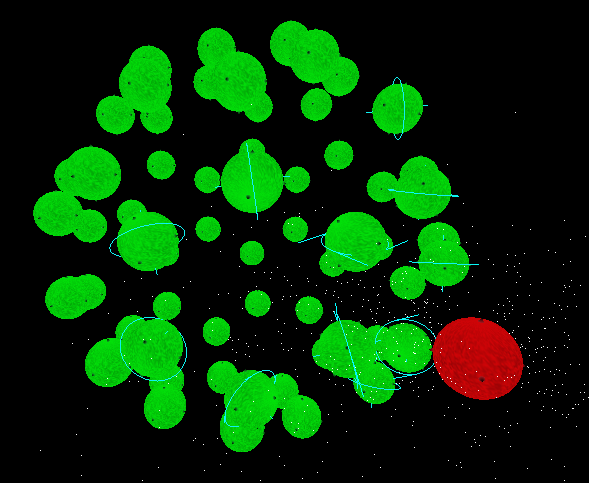 Any chance of providing larger random sized (say 1<=r<=5) particles?